Below are photos from some of the more memorable fires over the last 100 years in Glassboro. After the Whitney Glass Works fire of 1895, fire engulfed the Zane’s Olympian Hall on East High Street in 1907 and the Auditorium on Academy Street in 1917. Below is a photo of a fire at the Academy Street School, then known as the Grammar School, in February 1917. In December of 1944, five firefighters had a brush with disaster when they were trapped after the second floor of the Junior Mechanics Building located at High and Main Streets, collapsed under them. Everett Buck, Ray Harbert, Chris Siebert,3rd., Thomas C. Stewart and Robert Viden, Sr. escaped with their lives from this dangerous fire. Below is a rare color photo of a fire at Brown’s Grocery in 1954. The Goldman Basket Factory was destroyed in January of 1961. 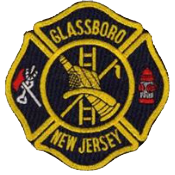 This is the longest fire in Glassboro memory, lasting about 30 hours. May 1977 saw the destruction of the auditorium at Bunce Hall of Glassboro State College. The Weir Furniture Store on North Delsea Drive caught fire in February of 1986.
suffered this devastating fire in October 1988. The Clover/Sav-A-Lot Stores located at Delsea and High Street was destroyed in October of 1993.